Grand Rapids offers outpatient services in friendly, welcoming environments for individuals, couples and families. Counseling, consultation, assessment and testing for all ages are available as well as a variety of specialty services, including: ADHD assessments, autism testing, electroconvulsive therapy (ECT), intensive outpatient therapy (IOP) for substance use/addictions, transcranial magnetic stimulation (TMS) and court-related services and assessments. The Caledonia Clinic is one of Pine Rest's outpatient clinics. The clinic is located in Caledonia, Michigan, just off M-37. Pine Rest's Caledonia Clinic provides the Southeast Kent and Barry County communities with quality behavioral health services, including therapy and psychiatric services for children, adolescents, adults, and families. We have immediate access to all of Pine Rest's resources, including experts in behavioral health, and inpatient hospital services. The Pine Rest Campus Clinic provides the Grand Rapids and southern Kent County communities with quality behavioral and mental health services, including counseling, therapy, psychological assessment and testing, intensive outpatient treatment for substance use disorders, as well as access to psychiatry and medication services. Our staff of highly trained psychiatrists, psychologists and social workers provide treatment to children, adolescents, adults and families in a timely, comprehensive, compassionate and professional manner. Located on the Pine Rest Grand Rapids, Michigan campus, the Campus Clinic has access to all of the counseling and therapy resources of the entire Pine Rest organization, including experts in behavioral health, partial hospitalization, inpatient treatment and residential services. Making the decision to seek help can be a difficult one. You can expect respectful counselors and therapists here to put you at ease. Flexible day or evening appointment times are available. [/vc_column_text][vc_column_text]The Christian Counseling Center is a ministry of Pine Rest Christian Mental Health Care Services. The Christian Counseling Center provides the communities of northeast Grand Rapids and northern Kent County with quality behavioral health services, including therapy and psychiatric services for children, adolescents, adults, and families. We have immediate access to all of Pine Rest’s resources, including experts in behavioral health, and inpatient hospital services. [/vc_column_text][vc_column_text]Pine Rest Christian Mental Health Services has been providing Electroconvulsive Therapy (ECT) for over 50 years with the most current technology and safety. This clinic enables individuals who suffer from various mental health problems to receive ECT without requiring a hospital stay. Sometimes patients come to the ECT clinic because it is their treatment preference. Others come because they have a history of poor drug response, a history of good ECT response, are sensitive to medication side effects—or in cases where rapid response is required. Receiving treatment at the ECT Clinic is convenient. Skilled and experienced psychiatrists, anesthesiologists and nursing staff insures that patients receive the best possible care. Our staff schedules all appointments necessary to begin ECT—including psychiatric consults, medical evaluation, EKG, lab work and insurance information. Using a video and brochures our staff teaches patients and families about ECT, and answers questions about the treatment. For more information about ECT, read our clinic brochure or this recent article from the Pine Rest Blog. [/vc_column_text][vc_table]Monday,7%3A30%20a.m.%20-%203%3A30%20p.m.|Tuesday,7%3A30%20a.m.%20-%203%3A30%20p.m.|Wednesday,7%3A30%20a.m.%20-%203%3A30%20p.m.|Thursday,7%3A30%20a.m.%20-%203%3A30%20p.m.|Friday,7%3A30%20a.m.%20-%203%3A30%20p.m. [/vc_table][vc_column_text]Treatments are on Monday, Wednesday and Friday mornings. [/vc_column_text][vc_column_text]We are committed to supporting the mental health needs of children, young people and their families. Every practitioner at the clinic is credentialed, licensed and trained to address the unique challenges children and adolescents face, while supporting and helping the rest of the family. Our team will work with you to get an accurate diagnosis and age-appropriate treatment plan. Our ultimate goal is to maximize quality of life and potential at school, home and in the community for every child, adolescent and family member. Psychotherapy for children, adolescents and their families including play therapy, family therapy, Cognitive Behavioral Therapy (CBT), Dialectical Behavior Therapy (DBT) and Interpersonal Therapy (IPT). [post_excerpt] => Services for children, teenagers and their families. Treatment for depression, anxiety, grief, family issues and more. The Ruth and Jack Loeks Residency Center is a state of the art teaching and learning space for the Pine Rest psychiatry residents. Working closely with faculty, second year psychiatry residents provide psychiatric assessments, treatment and medication management. The Loeks Residency Center shares the same entrance as the Campus Clinic on the Pine Rest campus located at 300 68th Street SE in Grand Rapids. Both clinics share patient registration space as well. [/vc_column_text][vc_column_text]The Northeast Clinic is located in Grand Rapids, Michigan, north of 3-Mile Road off the Beltline. Pine Rest’s Northeast Clinic provides the communities of northeast Grand Rapids with quality behavioral health services, including therapy and psychiatric services for children, adolescents, adults, and families. We have immediate access to all of Pine Rest’s resources, including experts in behavioral health, and inpatient hospital services. [/vc_column_text][vc_column_text]The Northwest Clinic is located in the city of Walker on 3-Mile Road NW just east of Walker Avenue NW. Pine Rest's Northwest Clinic provides the northwestern Grand Rapids community with quality behavioral health services, including therapy and psychiatric services for children, adolescents, adults and families. We have immediate access to all of Pine Rest’s resources, including experts in behavioral health, and inpatient hospital services. [/vc_column_text][vc_column_text]The Psychological Consultation Center (PCC) specializes in assessing the relationship between behavior and brain functioning. Clinicians use state-of-the-art tests and a comprehensive clinical history that generally includes an interview, discussion with family members, and a review of school and medical records. The goal is to provide an in-depth understanding of a person's strengths and weaknesses that can yield helpful recommendations for short- and long-term treatment planning. We work closely with school systems, family doctors, and other health care organizations to ensure evaluation results are used to obtain the best possible intervention or treatment. At the Retreat Center, we focus on addiction  — providing outpatient therapy, addiction medicine services, outpatient opioid detoxification and family support. Opioid Detoxification Program. Primarily treating patients who are physically dependent on opiates and suffer from the disease of addiction, the outpatient opioid detoxification program is a medically supervised detoxification program using a combination of buprenorphine and naltrexone in easing withdrawal symptoms. Patients in this program are also required to participate in one of our outpatient therapy programs. 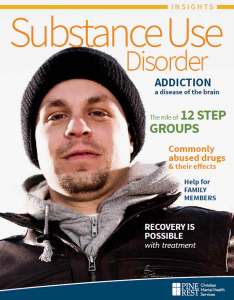 Treating Other Substance Use Disorders. In addition, the Retreat Center Clinic evaluates and interacts with persons with other substance use disorders such as amphetamine, sedative-hypnotic, cocaine, nicotine and alcohol dependence. For example, a patient addicted to a benzodiazepine such as Xanax that may have begun a tapering program in residential medical detoxification may continue that taper under the medical supervision of our addictionists in the outpatient addiction medicine clinic. With the exception of alcoholism, those with less severe symptoms may begin their tapers in this outpatient setting. In all cases, Pine Rest requires all patients receiving outpatient medical detox services to participate in outpatient therapy. Treatment is provided using a multidisciplinary team of physicians, psychiatrists, nurses and masters prepared counselors who are certified in addictions. To schedule a new outpatient appointment, or for details about this level of care or any addiction service in our continuum, please call 866.852.4001. [/vc_column_text][vc_column_text]When visiting our campus, the Retreat Center is the 1st building on the left, just after the duck pond. [/vc_column_text][vc_column_text]The Southwest Clinic provides southwest Grand Rapids and the surrounding communities with quality behavioral health services, including counseling, therapy and psychiatric services for children, adolescents, adults, older adults and families. We have immediate access to all of Pine Rest's resources, including experts in behavioral health, testing and inpatient hospital services.